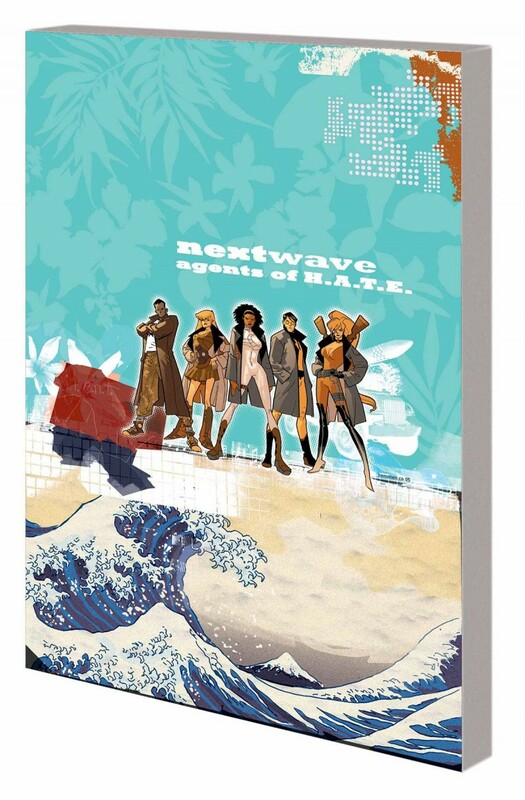 Collecting NEXTWAVE: AGENTS OF H.A.T.E. #1-12. RRRAAAAAGGGGGHHHHH!!! Action! Excitement! Explosions! The Highest Anti-Terrorism Effort, or H.A.T.E. (a subsidiary of the Beyond Corporation©) put NEXTWAVE together to fight Bizarre Weapons of Mass Destruction. When NEXTWAVE discovers that H.A.T.E. and Beyond© are terrorist cells themselves, and that the BWMDs were intended to kill them, they are less than pleased. In fact, they are rather angry. So they make things explode. Lots of things. Starring Monica Rambeau (formerly Captain Marvel and Photon), Aaron Stack (Machine Man), Tabitha Smith (X-Force’s Meltdown), monster-hunter Elsa Bloodstone and The Captain! If you like anything, you will LOVE NEXTWAVE! BOOM! Included on the Top Ten Great Graphic Novels for 2007 by the Youth Adult Library Services Association, Nextwave is a pure extraction of comic-book action and adventure, with plenty of kicks, punches and explosions along the way!